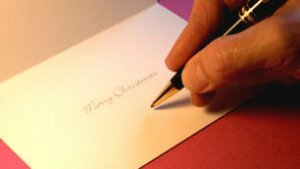 Sending signed and handwritten business Christmas cards is also a wonderful way to garner new customers, reconnect with previous customers and express gratitude for the support of your existing ones. All business cards should be signed by hand. Adding a short, handwritten message to your business cards provides a warm, and personal touch even if there is already a preprinted greeting on your card. It shows your recipient that you took the time to think about them individually and that they are worthy of a few reflective moments. Additional personalization goes a long way. Even if you cannot imagine having to write each address on the envelope (we can help), you will be glad you took the time to do it in the end. Computer-generated labels are impersonal and present your holiday greetings as a mass mailing or business ploy. Your Christmas cards should express your appreciation to colleagues, customers, clients and friends as well as advertise your service or product. Our qualified team of writers will hand address, write a message and stamp your greeting cards. Saving you time and showing your customers you care and they are important, setting you above the competition. Try real handwriting for your next holiday greeting card mailing. Visit our contact page to request a quote.